reylosaur wrote: JJ Abrams: Rey didn't discover her parents in Episode 7. 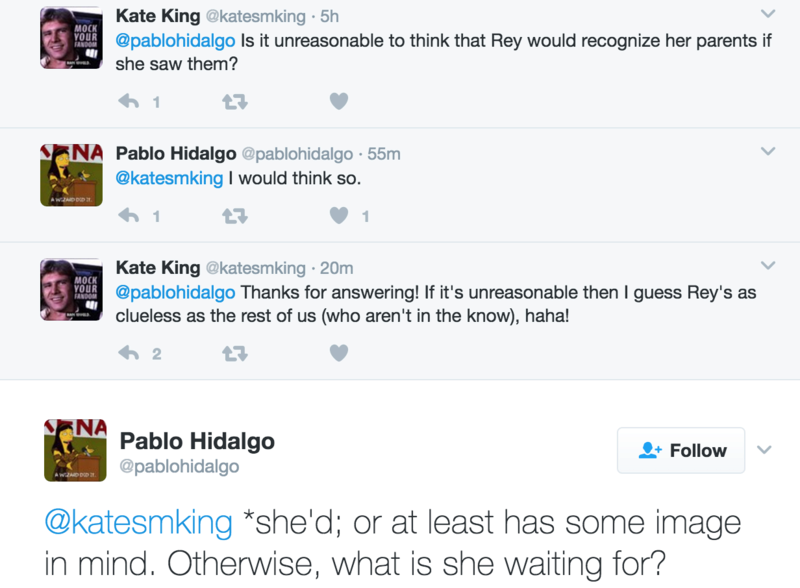 Pablo Hidalgo: I would think she'd recognize [her parents]. 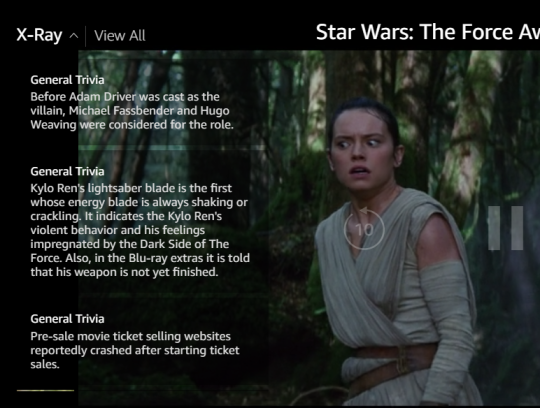 Rey's parents were not in Episode 7. In a world believing in "alternative facts", I'm afraid even the most obvious bill doesn't make sense. @BastilaBey wrote: Apologies if this has been posted already, just thought it worth sharing. “Home isn’t anywhere, then. My parents kicked my can down the road and moved on when I wasn’t looking. Went off to be nomads somewhere." Looks like parents leaving children behind and taking off wasn't unheard of in the GFFA. It makes sense for Rey's ethnicity to not be defined in casting if her parents were just some random people who dumped her with Unkar Plutt and went off....it also explains Maz's lines about the people she is waiting for never coming back. This theory is as viable as anything if you ask me. In a lot of ways the greatest mysteries about TFA were created by fans, not by the movie. Take Snoke's identity for example. Snoke theories have spawned their own memes as responses from Lucasfilm and yet nothing in the movie really presents any real mystery about who he is beyond the Supreme Leader and head of the First Order who commands Kylo. He's Snoke, a new character designed for the Sequel Trilogy, and yet the fixation on his "true identity" spawned from basically nothing. Heck, fans made theories out of questions that were answered in the movie, like why the Falcon was on Jakku, why Leia and Rey hugged, etc. Now, I don't think this is the case when it comes to Rey identity. There are lines in the movie that are meant to make us wonder who she could be, but at the same time is it impossible to think those lines were just red-herrings? Or as that one article preposed maybe Rey was simply telling the truth when she said she was "no one"? I know I've said this a bajillion times, but the mystery surrounding Rey really is all about Rey herself, not her family. It's always possible that mystery is more about what big role she's going to play in the future of the Skywalker saga and family. The people she was waiting for all those years, they're never coming back, and that's that. 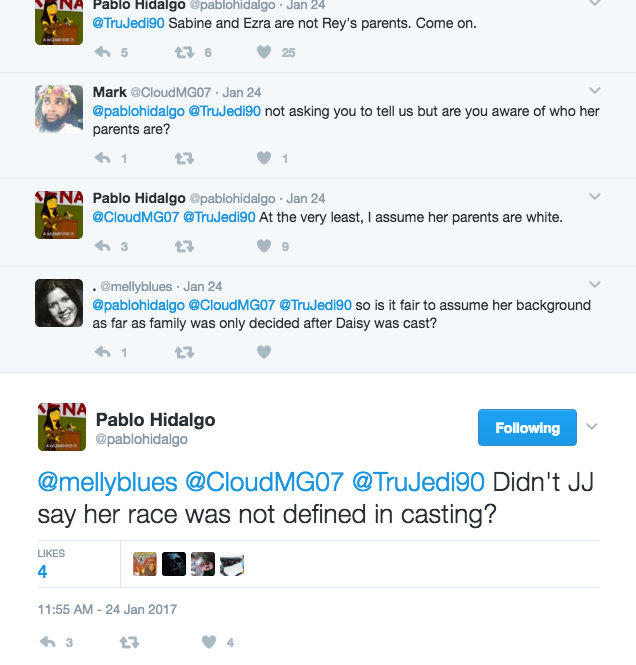 I do agree with you (and PH's tweet regarding her ethnicity not being a factor in casting definitely supports it).....that the mystery being more about her future role than her family makes a lot of sense...in the same novel (Aftermath), we find out that abandoned children either ended up in some imperial academy or if they were too young- an orphanage. 1. In the RO Visual Guide, we read about an orphanage run by the in Jedah in the shadow of the temple of the Whills. 2. Bazine Netal (the FO spy from Maz's castle in TFA) was left in an orphanage till she was adopted by a pirate and trained by him. 3. Jyn was an orphan and brought up by Saw and his partisans- not exactly the most stable home for a kid. 4. Rax was in an orphanage and recruited by Palpatine. 5. Doctor Aphra's father was obsessed with force worshiping and neglected his family.....her mother took her and ran off, died and left a young Aphra alone and she had to grow up dealing with nasty professors during her time as a student. 6. Yoda comes across a primitive planet of force sensitive children, where the parents have gone, and they have to look after themselves....and live in a Lord of the Flies situation. Broken families, runaway and deadbeat parents seem to be the underlying theme in all the supporting canon literature....so I really won't be surprised if Rey's past is something alone the same lines....where she was left on Jakku by her parents and Unkar taught her to be a scavenger. Do parallels with other Star Wars characters are necessarily meant to indicate from which lineage you come from? - Which Star Wars character does Rey parallel the most? - Which Star Wars character does Finn parallel the most? 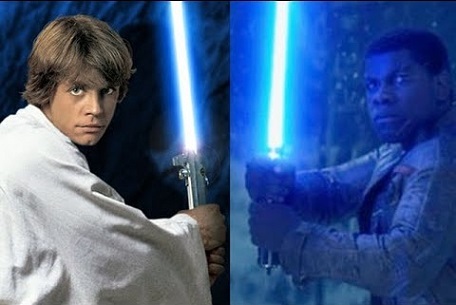 And here comes the question: Do the visual parallels between Luke & Finn imply that Finn is Luke's son or related to the Skywalker family in any way? ==> Rey plays that role because she saves BB-8 and is the bridge between the estranged Skywalkers since she's the only character who has met them separately: Han, then Kylo, then Leia, then Luke. ==> In regard to Kylo, I think that Rey is meant to have the role that both Padme & Obi-Wan played in Anakin's life: she is his love interest but more than this she is his soulmate because they share this Force connection that could allow them to understand each other completely and become a hell of a team. So it really depends on what one makes of parallels. Even if Rey was supposed to be mix-raced, it wouldn't have prevented her from being related to any important character of the franchise. 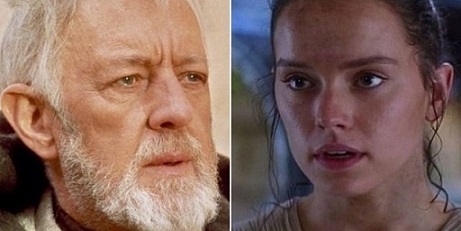 The problem is that she actually parallels various and very different Star Wars characters in TFA: Obi-Wan, Palpatine, Luke, Anakin, etc...Given all the parallels with Obi-Wan, perhaps she will turn to be a Kenobi but IMO her role in the story is what matters the most until it's confirmed she's related to him. I believe that, right now, lineage parallels only make sense in regard to Kylo because it's already been confirmed where he comes from. And, yes, she picked up the mind trick from Kylo. Given Rey's age in the forceback it wouldn't be hard to assume that she knows what her parents look like or looked like or even knew their names. In fact that's the most vague answer I have ever seen him give regarding a parentage question. It seems complicated is not him saying "nope"
It just means her being his relation would be complicated to explain. Maybe that's why they said originally that reys backstory was hard to write and that's why they entrusted jj. But I'm petty tired with pablos tweets being taken to mean something when he clearly does not say no. Rey random is the popular opinion on here and there's no point in debating lol. I have first hand info from those whom auditioned strongly suggesting that's rey is and always was a kenobi right from the very start, day one. (which will be revealed in a podcast.) There are countless other tweets and info from insiders and Pablo also strongly hinting she has never changed from day one and that she's a kenobi. All this is seemingly totally ignored the second a vague response from Pablo emerges neither confirming or denying anything. It's just a pointless debate. I mean an insider (AB) strongly claiming that she is related to obibwan is now totally forgotten simply because once again Pablo didn't confirm or deny anything when it comes to rey kenobi? But hey he didnt say yes or no so it must be no right? Didn't Daisy say that once her identity/lineage was reveal it will lead to more questions? That sounds like something that is complicated and will require more exposition perhaps in a Kenobi stand alone. Yes and someone in the production a very long time also said that in order to explain who rey is would be a very difficult and complicated task to do. I need to find the source. All this means nothing because Pablo was vague again. 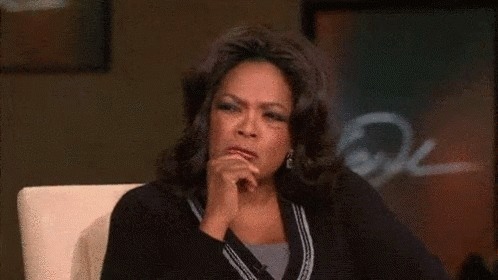 Oh and that casting call for a black or mixed girl? her being mixed race or black apparently means her grand parent most certainly can't be Obi Wan. 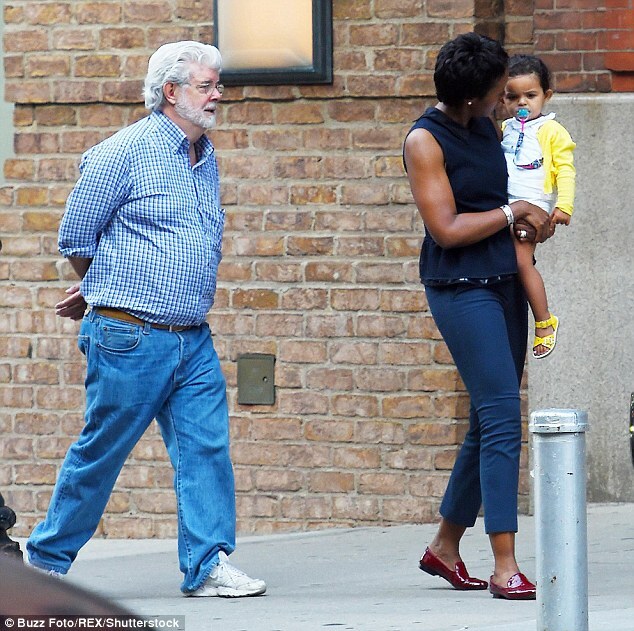 Even though there are incredibly strong rumours from the casting process that obi wans grand daughter was to be black or mixed race. Rey auditions were diverse and not race specific. Specifically stating that black or mixed could audition. I mean it can't be more obvious. One of the girls I spoke to who auditioned for rey is Black and what she told me strongly indicates kenobi. The evidence is right there visually in what you have posted. 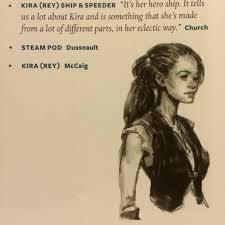 Yes a mixed race/black girl was to be a Kenobi granddaughter named Kira, just like the concept art, that is why her speeder is "eclectic" just like her....a mix of things. Can you give us any hints what she told you? Not necessarily word for word, but I mean... the type of things she was told, even in the vaguest terms. I'm very curious. @Gemini wrote: But I'm petty tired with pablos tweets being taken to mean something when he clearly does not say no. No, the popular opinion on here is not Rey Random. This board is mostly filled with people who are prepared for almost any origin story where Rey is concerned (a.k.a. we don't really care so long as it makes sense and adds to an overall engaging narrative). Most of us (speaking for others here, but I believe this to be the case) just don't see sufficient evidence for any theory as of yet. No conclusion has been reached, so we're keeping our options wide open. I think most of us are content just waiting for the movie on this one. Thank you! Well, well... that's very interesting. The accent thing alone would make Kenobi a strong contender, but also Palpatine... I can't imagine why the randomest of randoms would need to have a specific posh accent - unless they had a very specific idea of some RP-speaking posh/royal background for her. They were both told this. I mean if you were to ask Pablo he may say no. It's a choice if you want to believe them or not. Also in the American audition process they were told this apparently. I saw someone mention it on tumblr/YouTube. Oh, wow, this is a Reylated wreckage and a half. That's the thing. Most stuff that's out there is speculation and rumor, none of it confirmed by the officials. They confirmed color-blind casting for Rey, Finn and Poe, and they confirmed that Adam didn't have an audition and history of how he became the prime candidate. beyond that, whether there was ever a Kenobi (grand)daughter or other casting are just rumors that may or may not be addressed officially sometime in the future. Either way, Rey Kenobi theorists should be happy that Breznican claims LF has something in store so that's much more than other theories have. you are not underdogs in this fight. @vaderito wrote: That's the thing. Most stuff that's out there is speculation and rumor, none of it confirmed by the officials. They confirmed color-blind casting for Rey, Finn and Poe, and they confirmed that Adam didn't have an audition and history of how he became the prime candidate. beyond that, whether there was ever a Kenobi (grand)daughter or other casting are just rumors that may or may not be addressed officially sometime in the future. Thanks, but I don't think I would describe it as a fight. Sorry, war. cause that's what rey's parentage is, a fandom war. My degree is in history (minor in myth & religion) , and I love researching the history of things. All things not just TFA. That's awesome and helpful to establish timeline. they'll love it. Execution is everything. you can drop the ball on the most popular idea ever and make eevryone hate it and you can make the most divisive idea embraced by those who opposed it. What did that girl say that strongy indicates Kenobi? And that's all! If Rey is supposed to be related to an important character of the Star Wars franchise, there aren't so many options. Given that Yoda & Lando are out of the game, it leaves us only with Obi-Wan and Palpatine. About the Kenobi theory, let's say this: I have one feet inside, one feet outside. One feet inside because I didn't see the parallels by myself but I completely trust people like you - @Gemini - who brillantly pointed out these parallels plus all the clues (solitary life on desert planet, etc...). What's more, I find your theory about Obi-Wan's lightsaber very interesting. 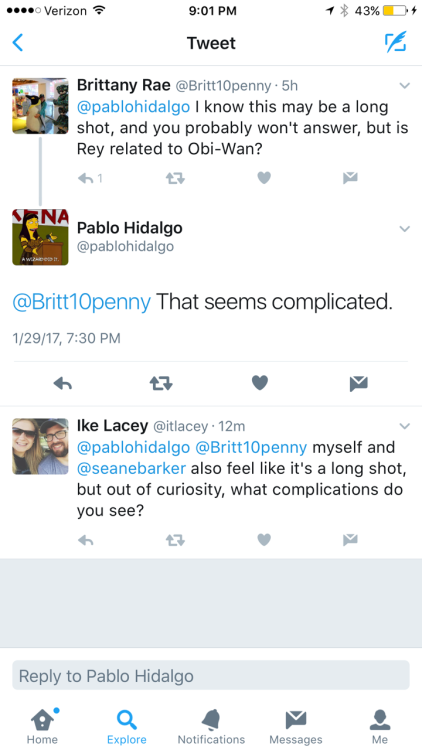 I also acklowledge that Pablo's answer isn't a clear no to this theory. Now, I am very careful for several reasons, including the one that I pointed out above. I don't think that parallels necessary prove lineage: if it applies to Finn, I consider it could apply to Rey. Plus, it depends on what Disney/Lucasfilm intends to do with Rey as a character in regard to her lineage. In the Star Wars context, lineage is what makes you royalty. Kylo is royalty not only because he's technically the son of a Princess but mostly because he's the heir of an important lineage in the Star Wars galaxy. So to me, the centra question there is: what kind of Disney Prince(ss) is Rey supposed to be in regard to her lineage? Prince Philip & Princess Aurora are the heir of two realms whose fathers are good friends/allies. So they were bethrowed from birth because the friendship of their fathers made it so. Then, the fate made things very well: they encountered years later in a forest and it appeared that the young woman Prince Philipp thought to be a peasant was actually the girl who was bethrowed to him years before. c. It wouldn't be the first time that the Force arranges meetings between people who are predestined to meet: the Force made it so that Leia would drop R2 on Dantooine, which lead him to Luke, who then found Obi-Wan, who decided to go to Aldaraan, which led eventually to the reunion of the twins. d. Rian Johnson's tweet about red thread has made a lot of people think to the red string of line: according to this legend, soulmates are predestined to meet and end up together. Cinderella is just a normal girl. She has no important lineage but ends up married with a Prince. If I take account of all Disney classics, there are only five non royal Disney Prince(ss) without including the HOND since the characters aren't royalty. Cinderalla: J.J. Abrams - "In this scene, she's drawn to this place almost like...Cinderella!" Belle: "Who is the girl? "; "What girl? "; "The girl I've heard so much about"
==> Aladdin was the third non-royal Disney Prince(ss): when Rey gets offended by Kylo's comment, it's a little like Aladdin who gets offended because he's repeadtedly called a "street rat"
==> So, the only non-royal Disney Princess who Rey doesn't parallel is Tiana from The Princess & the Frog. Aside from Tiana, she parallels all non-royal characters who eventually get married with a royal partner by the end. Interestingly, Disney introduced the non-royal Prince(ss) in the late 80' s and seems to follow more and more that scheme for Disney couples with origins as initial barrier to overcome. "To me, it's funny that people think it's important - because I guess it is - but I don't really think it is because regardless of where you come from, where you go is the point!" ==> So according to Daisy Ridley, Rey is just a normal girl who gets in the midle of a story larger than her own. To her, Rey's parentage isn't that important and she thought that a lot was answered in TFA. I could interpret completely wrong but my gut feeling there is that she probably thought that the answer being obvious in TFA, the question of her parentage wouldn't become that important for the journalists and the Star Wars fandom. To me, her answers sound a little like she didn't expect the question on Rey's parentage to become so central for people. ==> The fact is this is obviously the most recurrent question asked to her by journalists and by Star Wars fans too. When she was asked somewhen what was the most frequent question she got and that she brought Reylo by herself, I was so surprised. Personally, I have never seen an interview where she was asked about Reylo: this is a topic that she brought by herself, the journalist hadn't even heard about Reylo. On the hand, she's so frequently asked about Rey's parentage but apparently does't bring the topic by herself as if it wasn't a topic that she enjoys so much to talk about. 3) What is answered in TFA about Rey's parentage? a. "I know all about waiting!...For my family! They'll back one day!" c. "Dear child! I see your eyes! You already know the truth! Whomever you're waiting for on Jakku, they're never coming back!" ==> She is waiting for her family. Since they're never coming back, this means that they won't show up in the next films - unless through flashbacks. Given Rey's reaction and Maz's "I am so sorry" expression, it's quite safe to assume that her parents are dead. Disney Prince(ss) have all at least one parent dead. The most of the non royal Disney Prince(ss) Rey parallels are orphans (Cinderella, Aladdin, Flynn). d. "The belonging you seek is not behind you. It is ahead!" ==> These are the only answers we get about her parentage during the entire movie. This means that there were barely 2-3 minutes dedicated to the question of her parentage in a movie that last around 2h20 minutes. If they had removed the shot about Rey's abandonment on Jakku in the movie - like they did for the novelization - there would have been even less screen time dedicated to her parentage. ==> IMO, the only obvious answer that the movie provides (combined with Daisy's various comments) for the general audience is that her parents are dead, that Rey must go on because they're never coming back and that her parentage is apparently not as important as we tend to think. It doesn't mean that who her parent are and what happened to them won't have any repercussion on her journey but my gut feeling there is that their identity might not be as important as we tend to think. Now, even if Daisy didn't include the parallels in the "a lot was answered", it doesn't mean that her parentage with Obi-Wan is to exclude. The parallels are there anyway and it dependds then how one interpret them.